Alex J. Cavanaugh: Jodorowsky’s Dune, Movie Posters for Noah and How to Train Your Dragon II, Movie Trivia, and Ninja News! 2. Drawing a blank here. 5. Lion, Witch, and the Wardrobe? That would've given a lot of movies a run for their money. Too bad it didn't happen but maybe the documentary will give this ol' never was new life. 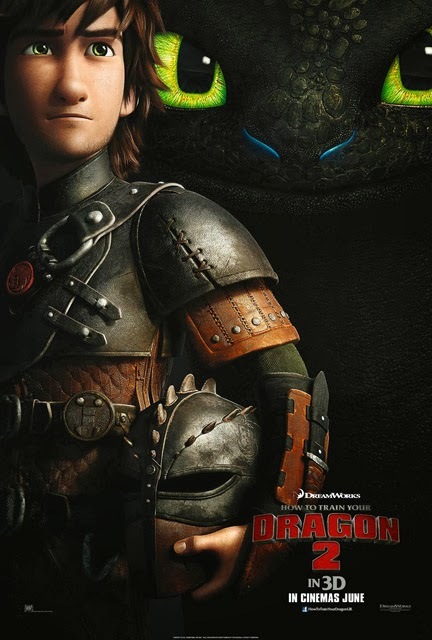 Dragon 2 is on top of my animated movie list. Right now I plan to see Robocop and the Lego movie this month. Wanted to see Ride Along too but...not likely to happen. Sigh, money I tell you. Congrats to all the authors featured today especially Cassie/Becca Ann who pretty much made history in my ebook purchasing by being the first indie author whose book I got release day. Translation she came in time of a giveaway gift card win and she writes amazing work so why not buy? Anyway thanks for going through my happy rant/comment and I have no idea what any of the movie titles are. Sorry. Oh and the posters look great. Thanks for the reminder of the A-Z theme blog reveal, I forgot about that, will go and sign up now. Can't wait to see Dragon 2, and I read the epic battle pt2 over at Father Dragon's cave, I want to hear you shrill, lol! Memento for no.3!! Yay! I am so happy to learn there's going to be a Dragon 2 film too!! I LOVED the Dragon/Riders of Berk series and the first film - awww Toothless!! I so want one!! Sadly, I won't be doing the A-Z this year. I have a new release coming out the 21st - announced on my blog today in fact! I want to hear your shrill cries, too!! Ironic that Jodorowsky's Dune was rejected as too expensive, since the version of Dune that was produced was one of the most expensive flops in cinema history. That wastelands antho sound right up my ally! Tony, you are first! And nailed three. Sheena-kay, she'll be happy to know you snagged her book. Kitty, correct, and I'll see if I can't get you a Toothless. Terri, congratulations! And you are correct. Mark, you lost it with your wife's linens. Sean, it was, wasn't it? Wow! Lots of Ninja news this week. So glad the promotion went so well for your book. That's awesome that Donna is willing to promote other author's books at Children's Festival. It sounds awesome. I won't be doing A to Z this year (will explain more in a future IWSG post), but I look forward to reading about other people's themes, including yours! And instead, we're left with the slightly unfortunate TV version of Dune, complete with Sting. Would have been neat to see the Dune that never was. Umm, science fiction is way over my head . . . and can't do A-Z because of NC move (sorry, not Wilmington). Mick Jagger? That's all kinds of cool. Too bad it fell through. Congrats to all the authors with releases! Dune was such a unique movie! Epic! Please don't tell me they plan a remake! Beginning to hate the remake! Such a nice tribute to Jeremy, so creative! I suppose being accused of having big vision isn't always a bad thing. I'm sure they said the same to Lucas and Spielberg. Apparently my brain can't do movie trivia in that direction. I would have to look them up. Crap. Cynthia, sorry you won't join us but understand it's a huge undertaking. Heather, sure they said the same to Cameron. And my brain doesn't engage until at least noon. Brian, really hoping they don't ruin it. Noah has Jennifer Connelly in it!! Then this is a must see for me, as she is one of my celebrity crushes! I remember seeing a Dune movie or TV show. I didn't know anything about the book at the time. Don't know what it was. Love the poster for How to Train your Dragon. I have that movie, it's fun. Too many releases too little time. So many new book! Very exciting. I'm looking forward to Mary's new Backworlds story. I wonder of Jodorowsky's version of Dune wouldn't be possible now. The illustration of the worm looks fabulous. Part 2 of your epic battle at the Dragon Cave was even better than part one. Al is amazingly talented! Totally missed the A-Z theme blogfest but I need to sign up for that one. Great idea. Dragon 2 sounds awesome. Heard bad things about Noah though. Congrats to M. Pax, Milo, Cassie, Nigel, Toi, and Marcy for their new releases/covers! 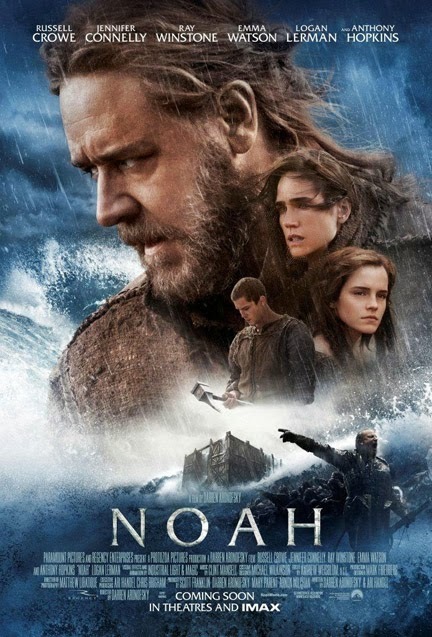 Haven't heard of Noah but love the poster. Congrats to everyone--so much good stuff happening! Interesting about Dune--too bad it didn't work out. I loved the book. Dune is such a cool book. Funny that Mick Jagger was the hoped-for star when Sting is in the crappy version. Can't wait to see How to Train Your Dragon 2. I loved the first one. Noah looks pretty epic, too. I hope the writing is going well. Poor Jeremy! He is the very best kind of person. Congrats on Cassastorm, what a great story. I loved it. I can't wait for A to Z! been nice to have seen that Dune. Back in the early seventies, I ordered two books from my high school's Scholastic Books Club. One was Dune. The other The Fellowship of the Ring. The price was 95 and 75 cents. I think I got my money's worth. Yay for my crit partner, Marcy!! Nice posters and nice covers. (The World on Edge cover is great.) Father Dragon's duel is awesome. Seen all the Dune movies, but have never read any of the books. Happy A-to-Zing this year. Keith, you must see it then! Jo, the book series has been around for a long time. Bish, you would think with computer animation it would be. Julie, glad you are enjoying our battle. Lexa, it's had some production and rewrite issues. Shell, not sure either fits the bill. I look forward to the Noah movie--I hope they don't botch it or make it have all sorts of weird ideas. I read one of the books in the "Backworlds" series by M.Pax and really enjoyed it. She's an excellent writer in my opinion. Oh perfect -- thanks for letting us know about the theme fest. I love me a theme. Wow that Dune version sounds awesome. Such a great story. How fun with the winter olympic venue. Hoth for sure, but a bit dangerous when athletes are attacked by snow beasts. SO happy for you and CassaFire's success!! Yay! And Noah! Wow I can't wait for that. hadn't even heard of it yet. And Crowe as Noah? Ok that's the most awesome thing I've heard all day. Very interesting documentary on Jodorowsky project! Dune is a movie that actually could use a remake. But they'd probably give it to Michael Bay and make it even worse than the last one. Congrats on your Amazon success, Alex. The last one is the first Narnia movie. Loved Father Dragon's post today. I'm probably the only one who liked Lynch's Dune. Did not like the books though. I am always amazed by the news you have gathered for us. Its been quite some time since I have seen a movie. The last movie I saw was Last Vegas. I agree that the scope of Dune makes it unfilmable. It just wouldn't translate very well on the big screen. The art looks pretty amazing. Noah intrigues me. That's one I will probably see. 4. One of the Die Hards? Heat was a good movie. They were all still Noah. Hope sells are continuing to rise, Alex! Bet they are. Have the olympics on Hoth. Just look out for the Wampas and Imperial AT-At's. Jeff, the books are as weird as the movies. Maybe weirder. Lee, that's what I fear. At least they have the scientific reason for the flood right. Liesel, you got four! I'm really hoping they get it right. Nothing more offensive then messing up a Bible story. Elizabeth, they were in the fifties! What's up with that? PK, now you're in Heaven, right? Moody, that just sounds awful. Diane, correct! And didn't like the book either. Once again you amaze me with your diligence in promoting others on your blogs, Alex. The work you put into this is phenomenal. Creating posts dedicated to others is not easy, yet you make it look that way time and time again. Kudos to you, for being such a friend to your fellow bloggers, kind sir. Will have to catch the Dune documentary - one of favourite SF books. A film that should have been made. Visited Jeremy. OUCH! I think I will sign up for the A2Z reveal. I don't know any of the trivia as usual. I'm just surprised with all of the movie rehashes of late that no one's redone Dune. With all of the technology we have now, I'm sure Jodorowsky’s vision could come to life. And then some. Also, I know we already said it, but thanks again for having us last week. It was a blast popping in and seeing all of the responses. And no haters! Yay for that! Just that picture of that Dune creature seems rather ambitious for that time frame. I wonder what a remake would be like now? So many wonderful things happening with familiar author buds and new-to-me-peeps. That Call Center of Doom caught my attention since I've been stuck in a call center since like. how long now? Ugh! lol!! Well I'm annoyed that he didn't finish that DUNE version. But very special effects can be expensive. Dune is an all time fave with me. Herbert and Asimov are my heroes. Good luck and congrats to those with new books and interesting news! I'm very excited for the new How to Train your Dragon. My dad and brothers used to be huge Dune fans. They kept talking about the movie but I don't ever remember watching it. I've been meaning to find the books, or movie, because from what I've heard it sounds really interesting. My daughter is so hyped over the new How to Train your Dragon movie that she's constantly scouring the Internet for every detail she can find--and then making sure I'm aware of it. Like how many years older Hiccup will be in the second movie. Or how he's been growing steadily taller throughout the TV series in order to match the upcoming movie. Who knows? Maybe by the time it comes out, we'll have gotten rid of enough of the snow around our house so that we can actually go out and see it. I can't wait for How to Train Your Dragon 2. The first movie was amazing. I've seen the trailers for Noah and it looks promising. I think I know some of the trivia. #1 Heat, #2 Red, #3 Memento, not sure of #4 or #5. MJ, glad I make it look easy!! Brandon and Bryan, happy to host you. No haters here - I wouldn't allow it. Angela, you may or may not want to read it then! Jack, interesting is a good word. Ken, I hope so! I don't think your daughter will allow you to skip it. Congratulations on CassaStorm and the reveal of so many new books. Your movie info makes me wish I had time to go see the new ones. I do watch some of them years later on TV, long after everyone has forgotten them! Yay for CassaFire! Yay for all the new releases and book anniversaries. There are so many friend books, my reading list needs a building permit! Oh my Dune...that movie brings back a great memory. The movie Dune was out and I begged my dad to take me to see it. He was so proud, was his little girl, developing a love for sci-fi? Nope. Sting was in the movie...SHIRTLESS!! When I told him, I got an eye roll and a head pat. I loved the book Dune. I was dreadfully disappointed in the 1980s film version. With that ending, my thought was: did they even read the book? The miniseries with William Hurt (I think) did a much better job. The story, with this first book alone, is big enough to justify more than one film. Like LoTR. Woohoo! So glad CF rose to the top of Amazon, Alex. I wish I knew any of the trivia, and wish I was ready to decide on the A-Z challenge...still thinking about it. I'm really excited about Noah! Such an important story and really great talent acting in it. I can't wait!! And I feel so lame I don't know any of the movie trivia, lol. Congrats on CassaFire's success, and to all off the authors on their new releases! Hope Jeremy is feeling better! Lots of interesting movies coming out! I actually have the first Dune book sitting on my shelf. I bought it a few months ago and it is in line to be read. I can't wait for the next HTTYD movie. The first one was epic. Okay off to the see the ninja and the bald man duke it out. I'm so excited to see How to Train Your Dragon 2! Hogwarts!!! Like a Triwizard Tournament but the Olympics! No blogging for me today! My Apple burped and rolled over, playing dead. Noah looks amazing. Just saw Gravity in 3D and was blown away by that one's special effects. Glad your book went to the top. Hurray! And here's to Mary and her latest release. I don't think anyone could have really done a better job with Dune than they did with the miniseries. Sorry to say I won't be doing the A-Z Challenge this year. Even though the past three were a lot of fun, I need to devote more time to my book. As I told everybody, I'd like to finish it before someone needs to finish it posthumously. I like the idea of Olympics in Narnia :-) I'm sure Gondor could successfully host an Olympics. Elizabeth, that made me chuckle! Donna, maybe someone will do that. Robyn, hope you can join us. SL, you nailed all five! Lee, weren't those special effects amazing? Al, the book is more important! Deniz, hope a theme hits you soon. Thanks for sharing Beyond the Binding's purchase links and our Great & Powerful THEME REVEAL! I'm still laughing over Al's Epic Battle Part 2! 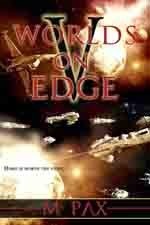 LOVE Mary's Worlds on Edge cover!! John Powell's score for How to Train Your Dragon is one of my all-time favorites! Hope his ankle feels better soon. So did you get your wife anything special for Valentine's Day? Or are you one of the many that don't celebrate, either? Lots, I'm reading don't but this year, we really had a fun go of it. So much talent, so much determination, so much productivity. Thank you all. I just signed up for the Blog Theme Reveal Blogfest. That filled up fast. I'm in the 90s. I like the good people in the Rocky Mountain Fiction Writers group. I'll stop over and check out their group and possibly join. Will take a look at the A toZ. So, I decided to hang out in blogland for a bit, and had completely forgotten that you told me you would put up a blurb for my new book. Thank you! It was a delightful surprise to see it here alongside all the other great authors and their work! Thanks for all that you do, Alex! And I love those movie posters too. I think having the Olympics in some fictional worlds would definitely make things even more fun! You're the best trivia guy ever. I'm like 'I remember this movie'. Followed by 'I don't remember the title'. Can't wait for How to Train your Dragon 2. Maybe you don't know this but I like dragons very much. Check your twitter, time for bets! I read DUNE - the German title is DER WÜSTENPLANET - a long, long time ago in 1978 and I still remember a lot of things!! I alos watched the 1984 Dune movie by David Lynch which was not that bad. But I must admit that Jodorowsky’s Dune is new to me. I read it with great interest. I've signed up by the A to Z theme reveal. Both my blogs will have a theme, which I hope readers will like. To save time and list space, I only signed my main blog up by the list, and will reveal the themes for both blogs by my main blog. Lots of interesting sounding book releases there. I'm looking forward to the GREAT & POWERFUL A To Z Theme Reveal! Thanks for reminding me. I have a question for you. 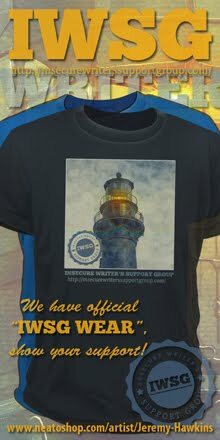 Remember how you ask us in the IWSG to get the word out about your newest book (of course you do, it was just a couple of weeks ago)? It just seems like a great idea to have an online community like that. I mean, one that will promote your books and then help build up the sales on the free offers. I am in no way ready for such service, but would love to participate in the like. Do you know of any blog/group/hop that does this sort of thing on a continuing basis? I think it's too bad that movie never got made - I'll bet it would've been cool. Samantha, you're welcome, and glad the battle amuses you. Whisk, I got my wife some flowers. Beverly, hope you can join us. Tyrean, of course I would feature it! Natalie had it up at Literary Rambles as well. Al, and I didn't even have to take off my clothes! Edi, you'll have to watch the documentary when comes out. Yvonne, I am counting down and praying my theme comes together. Leanne, Writers4Writers does that, but they are on break right now. I know 3 is Memento and 4 is Die Hard 2. I didn't even need two seconds to guess that one. Dune sounds fascinating. I'm looking forward to the 2014 A to Z challenge Alex, its always exciting. Lord Baldernot reminds me of Balok in Star Treks classic Corbomite Maneuver. You'll have to think like Worf. Everything about that Dune project is fascinating, so I'm looking forward to the documentary. #3 is definitely Memento and I'll try and come back for the others. I feel ashamed that I can't get any answers especially since I like Bruce Willis and Liam Neeson films. I still can't decide on the A-Z because things keep cropping up! Those cat's eyes are freaky! Congrats to all of the authors who released today/recently! So many interesting books ~ So little time. 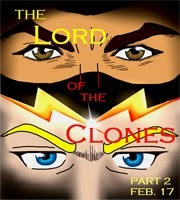 I wish I could clone myself! I'm always dubious about filmmakers tackling great sci fi ~ and I loved the Dune series ~ maybe it would have worked and maybe not. Cloud Atlas as a movie did not work ~ not that I expected it to. But LOTR was great. Thanks to the link to Rocky Mountain Fiction Writers! Have a good one, Alex! I didn't know they were making a second How to Train Your Dragon Movie. I loved the first one. Congrats to all with new books and I love Mary's cover. Just started reading CassaStorm, along with 2 other books. Trivia:#1 Casino #2 Red #3 Memento #4 is Die Hard 2 #5 The Lion, the Witch, and the Wardrobe. So exciting--the new books. I love it. Way to go Milo!! And I am please for the other too . . Dune could use a lot of CGI to make its monsters and landscape. I loved How to Train your Dragon, so I look forward to the second one. The battle over at Father Dragon's is soooo cool! Like Elise, I really want to see HOW TO TRAIN YOUR DRAGON. Best of luck for all the debut authors. How about Whoville for the Winter Olympics? Boy, there IS quite a few releases in that list! Love Mary's new cover. Alex, my synapses are NOT snapping tonight. I think it's still being effected by all that anesthesia. All I know is I've sure been doing lots of sleeping and I cannot brain today, I has the dumb. I'll pass on the trivia. Awesome bookish news! Congrats to MPax, you, and everyone else! Love to see good things happening for everyone. The first movie was Heat I believe. I liked it at the time of watching, but it hasn't aged well. Congrats to everyone's book launches and loving Mary's new cover! I'm so happy for Milo's story in the Wastelands 2 anthology, and for your own spectacular showing on Amazon! Usually I can get one of the movie trivia questions, but this time I completely flunk out. I won't be participating in the A to Z, but I want to visit as many blogs as I can -- so many exciting writers out there. Spacerguy, thanks for the tip. Fanny, hope you can join us. Cathrina, thank you! And you got four right. And that made me chuckle. Kimberly, Al's done a great job with it. I'll go with Memento as on of the trivia questions. I don't know the rest. And I'd love to see that Dune doc. I haven't read it in over 10 years, but I think I remember it okay. I never read all those sequels though. And I read Nigel's ebook last week. Really enjoyed it quite a bit. Everyone should read it. So much to do after reading this post, Alex. I need to hustle over and sign up for the theme post. I hope Noah turns out to be a good movie. Same with Son of God. It's good to see these types of movies being produced. Great post and lots of really good info and news on new releases and upcoming events! Congrats on making it to the top of the Amazon Charts! Can't wait for the big A-Z Theme Reveal! Have a Happy Tuesday! Speaking of Narnia, number five is The Lion, the Witch, and the Wardrobe. Four is probably a Die Hard movie, though I'm not sure which one. Three is most definitely Memento. The other two I'm not sure of. Wow, that sand wurm by H.R. 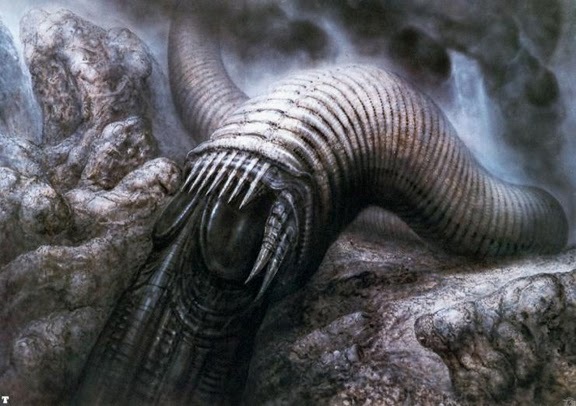 Giger is really cool. It makes me wonder what this project might have been like if it had completed. And I'm excited about most of the summer movies. Hope you are seeing the sunshine today! What great news for many-it feels like a party over here~ Congrats to all!!! Interesting about Dune. Such a great book, but it's hard to bring to life on the screen. Also, nice to see the plug for Milo's work...very cool! I heard about Jeremy's ankle. Major bummer. Hopefully he'll heal quickly. And I can't wait to see How to Train Your Dragon 2. #5-Lion, Witch & Wardrobe, only one. We went to many movies over the long wkend. Enjoyed them all, incl. Winter's Tale. Metaphors abound, symbolism, good vs. evil, joy of miracles, love reunited--all good stuff. What did the reviewers see? I am very late to this party. Yesterday was CRAZY. The Dune that never was has got to be better than the Dune that was. I was pleased to find out that the amazing alphabet challenge site has done a tribute to Retro. A mishap, indeed. I remember watching a Dune mini-series starring...good looking guy who can't really act...1980s maybe? Haven't read the book (books? see, clueless). However, my tastes have changed and I'd be all over that in a heartbeat if someone did it now. Jeremy's thing sure turned out great! Too brain dead for the trivia, though the format is awesome and reminds me of a board game we used to play a lot called tri-bond. Rusty, correct! And I have his book on my iPad. Robin, no worries, and you got three. Penny, your human will be amused by the Lord of the Clones. Tina, that would be Sting. And yes, Jeremy's About Me was a huge success. 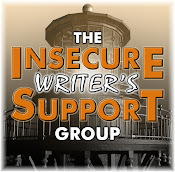 Alex, thanks so much for mentioning the Rocky Mountain Fiction Writers Google+ Group. I'm really looking forward to How to Train your Dragon 2 .. Noah looks pretty cool as well. Jotenheim is quite desolate for my liking; I think I'd prefer Narnia. That version of Dune looks like it would have been great. Too bad it never happened. I would've loved to have seen that version of Dune. There's been a few attempts over the years, but none quite reached its potential. So much awesome stuff here. I've been meaning to see Dune. I think everyone already knows that my theme will be books since it's always my theme. By the way- I am signed up for A-Z! Jamie, it would be more fun! Kathe, got two, and welcome to the A to Z!! Wow! Loads of new releases- thanks for the update. I will be sure to check them out. :) Not sure I'm joining the challenge this year- too many things in the works- however, i am really looking forward to reading everyone's wonderful ideas and posts! Should be fun. Hope things are good! Best! Haha, love the idea of sci fi winter Olympics venues. Great choices! I want to see Noah but I think I'll wait for it to come out on Netflix or Redbox. Headed over to give Roland some love. Looking forward to NOAH -- and thanks for the shout-out, Alex. Dune, along with some other stories, I think deserve a chance to be told with the new tech that is now avaible, but that doens't mean Hollywood wouldn't still find a way to over do it or mess it up some how. Thanks for the mention of my new release, it's all very exciting. There is some hard trivia you've posed. I only know one right off. I'll have to consult IMDB for the rest.